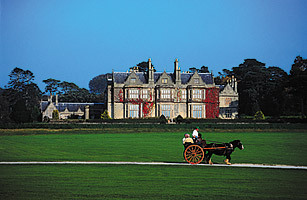 Travellers take in the view of Muckross House in Killarney, Ireland, one of the destinations of Smithsonian Journeys. For many affluent travelers, traditional escapes to Hawaiian resorts and European capitals are being nudged aside for more educational fare. Even private jet tours costing $45,000 or more for a few weeks learning about places like Easter Island and Mali are going out full, sometimes with waiting lists. Barbara Isenberg spoke with Amy Kotkin, director of Smithsonian Journeys, the largest museum-based educational travel program in the U.S., about what's going on. Barbara Isenberg: While the Smithsonian's been offering educational tours for nearly 40 years, the marketplace seems to have expanded in the last few years. Any thoughts on why? Amy Kotkin: There are more boomers who are retiring, who value their time and who have an unprecedented amount of wealth and education. They're looking for access�they want to go behind the scenes, where people aren't generally allowed, and they're looking for insight from experts. They want authentic experiences where they're truly experiencing another culture, not a facsimile or re-creation, but they want to be comfortable as they do it. Isenberg:Let's start at the top with your around-the-world trips in private jets. How did those exotic trips begin? Kotkin: A few college alumni and museum affinity groups were offering private jet trips in the mid-1990s, and we began ours in 2001. At first, we didn't think our travelers would buy this product. It was much more expensive that anything we had previously offered to them. But they proved to be very popular. Isenberg:The itineraries on these trips are inordinately far-reaching and complicated. How do you decide where to go and then manage to pull it off? Kotkin:You have to work very closely with the jet tour provider. Our current provider, Starquest, generally uses Boeing 757s specially configured with 88 VIP-style seats instead of the standard 228, and they have to know where those planes can land. They need to know what destinations have the infrastructure�hotels, guides, places to eat�to accommodate a group of 88 people comfortably. The hotel doesn't have to be five-star but it has to be comfortable. You need buses. You need to be able to serve 88 people good food all the time, all at once. When the group arrives, somebody has usually been there for a day or two already, walking things through. Isenberg:You offer variations of these private jet trips every year, so I'm assuming they sell well. Kotkin:They sell reasonably well. Our "Extraordinary Cultures" trip in March, '09 is almost full already. We usually start selling those tours 16 months in advance, and while some people sign up right away, others don't, and we have to remarket two or three times. Our 34-person "Lands of the Great Buddha" trip, which sold out this year, will go out again in Sept. '09 to China, Japan, Mongolia, Bhutan and India to see how Buddhism evolved in those countries. We're also looking at a private jet trip to Africa in 2010. Isenberg:These trips are all priced at $45,000 or more. What about tours for the rest of us? Kotkin:We offer about 250 escorted educational tours a year. Our Signature Tours, which are higher end, are accompanied throughout by an academic, and our lower priced Travel Adventures have local lecturers who meet up with you along the way. If you're going to the Great Barrier Reef, for instance, you'll meet with a marine biologist, and if you go to Iceland, we'll make sure there are talks by geologists. Isenberg:In other words, the idea is to get travelers to places and people they couldn't find so easily on their own? Kotkin:Yes. We also do one-off trips where we can provide special access to what is already an exciting event, like a major golf match or the Toronto Film Festival. One of our perennials is a "Mystery Lover's" tour of England and Scotland where travelers meet mystery writers and visit places where mysteries take place; we've had whole book clubs travel together on that trip. Isenberg:Given how different these tours are from one another, what do they have in common? Kotkin:Our tour operators share our notion of good itinerary planning for this market. Often that means slowing it down and spending enough time in key places to let people truly understand and absorb what they're seeing at a reasonable pace. We also find top experts you'd really like to be with for 10 or 12 days and who are not admired just for their knowledge in a formal lecture situation. Isenberg:Have you noticed any commonalities among the people who travel with you? Kotkin:Yes. When you decide to sign up for a learning vacation rather than having fun in the sun, that's the first cut. When people unite around a special interest and are willing to travel to far away places, the likelihood of their being with other people who share that passion is very high. The more specialized the trip, the more cohesive the group. Isenberg:Since many people sign up for these trips so far in advance, you probably can't really measure the impact of the current financial crisis. Have outside events affected you in the past? Kotkin:Our business contracted after 9/11, but since 2004, we have been increasing the number of trips and passengers. There's a little softness to the current market, but I haven't sensed a real downturn. Frankly, I would have thought there would be more softness, but we're holding up pretty well. Isenberg:What does the Smithsonian Institution get out of being in the travel business? Kotkin:Revenue from the tours provides essential support for the Smithsonian, which has 19 museums and nine research centers. Smithsonian Journeys was designed to extend the Smithsonian's mission of "the increase and diffusion of knowledge," and it's done that. Three Smithsonian anthropologists will accompany the March '09 trip, for example, and the trip not only allow travelers to go virtually around the world looking at indigenous cultures but also highlights decades of Smithsonian research in those same areas.